Not sure I've confessed this on my blog before, but we are Duck Commander fans. I know that evokes one of two responses for most of you. It's either, "Cool, we like them too!" or, "WHY on EARTH??!!" If you now are questioning my judgment, feel free to move along and not read this review. But if you have kids who love Willie, Jase, Phil, Uncle Si and John Luke... read on. 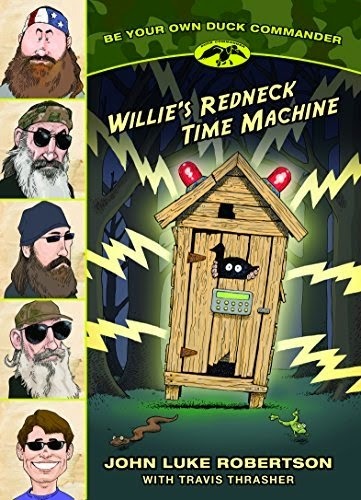 Willie's Redneck Time Machine, by John Luke Robertson (with Travis Thrasher) is a fun juvenile fiction title. This is actually one of four title that have recently come out, and my middle guys are telling me that we need to own them all. This is a bit of a "choose your own adventure" style, which doesn't appeal to my older teens at all, but the 10-year-old and the "11 days until I'm 14-year old" love it. The Doctor Who-like aspects appealed to them a lot too. Think outhouse instead of police box, and both are bigger on the inside. In this volume, Willie finds a mysterious wooden crate in the Duck Commander warehouse. Only John Luke is around, so the two of them open up the box and find a strange device. It turns out it's a time machine that looks a bit like an outhouse. Willie and John Luke test out the machine and find themselves journeying back and forth in time. They have crazy adventures but know they need to make it back to West Monroe. But will they make the right choices to get back at the right time? So, Thomas had this to say. "I enjoyed it. I found it very funny. It is somewhat strange. The characters are definitely very like what you see on tv." He's not much help at all. He did tell me that he really enjoyed going through and having the book insult him for being too scared to enter the outhouse. The first chapter has John Luke entering the outhouse, and not coming out. You (Willie) have your first decision to make: enter the outhouse, or don't. If you don't enter, then more people come along and disappear into the outhouse, and you continue to choose to enter or not. Thomas found it hysterically funny to keep choosing to stay put. One thing I really love about this book has to do with my struggling readers. Something that is really good for these kids is to read and re-read the same text, to build fluency. This "choose your own adventure" format encourages reading and re-reading, to see what changes when you make other choices, to see how you end up in the same place anyway, or just to see what happens when you make the wrong choice. Seeing as a certain someone has a birthday coming up (in 11 days, in case you've forgotten), my plan is to get book number two. And he'll probably get the third one for Christmas. Mostly because I want him to have some time to read and re-read. Do you want to win one? Disclaimer: I received this book, and one to give away, for free from Tyndale House Publishers. No other compensation was received. The fact that I received a complimentary product does not guarantee a favorable review. I have never even seen Duck Commander, ha! Now I'm curious! My boys have some redneck friends so they might find this hilarious and I think my almost 10 year old would love a "choose your adventure" story! My son and I would both read this book. We like the Robertson's because not only are they funny but their also strong in their values. We need more of them on tv and less of the bad stuff.